Haven’t written much on here in a while, mostly due to the fact that its only just over a month until the end of year show and presentations. I’m currently going through the process of trying to put all of my work this year into some kind of coherent structure, hoping that I eventually find out how to wrap it all up. In an intense tutorial/end-of-the-world-showdown a few weeks ago, the phenomenon of Amish barn-raising was mentioned in relation to my project. I nodded and pretended to know what it was. Much later, I thought I should probably find out. 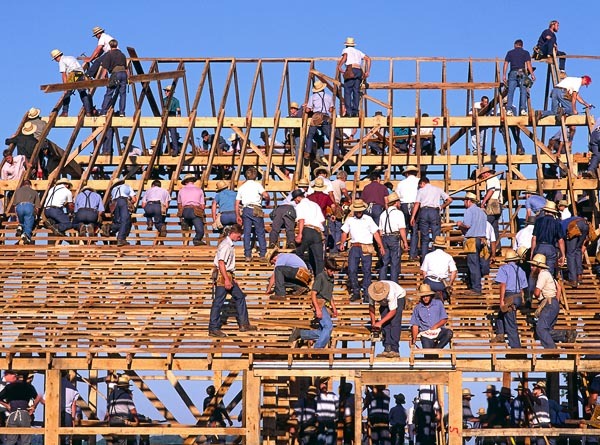 A barn raising is exactly the sort of collaborative social event that I have been researching and becoming interested in over the last few months or so. An entire community comes together, and through working together and relying upon one another, they are able to build a barn in about two days. There is an interesting mix of organisation and absolute amateurism within these groups – there is much preparation done before the raising, which then allows less experienced or skilled members of the community to still play an important role. Participants are not paid, and all able-bodied members of the community are expected to play a part. The payment for the individual instead comes in the form of camaraderie, a great sense of social achievement, and the possibility that now that you’ve scratched someone else’s back, they might scratch yours. The preparation is integral to it working – parts are constructed separately in the lead up, with different parts being made my people with different specialities or interests. It is this process of working separately first that makes it possible, and that sets up the “event” – the sense of event being necessary to summoning the required manpower and energy to complete the building as quickly as possible. It sounds like a Big Society project, doesn’t it? Thing is, the communities that partook (and in some cases, still do) in such things existed very much in a world either before or outside of the capitalist society that we now live in. And in our world, the mentality that affords barn raising seems far more idealistic than realistic. I’m interested in this idea though, perhaps not as a way of building things but as a metaphor – of how a local network of individuals can co-operatively create something greater than what they could ever achieve alone. This entry was posted in Thoughts and tagged amish, barn raising, Building, co-operation, Collaboration, folk. Bookmark the permalink.